The main difference between the new version and the old site is the navigation – the old left sidebar has been replaced a header navigation, such as that used by The Times in its recent site revamp. I don’t think that this in itself has adversely affected the navigation, but I do find the blue background an the navigation header offputting, making it harder to quickly distunguish between different links. The header is also little too cluttered, while the drop down menus can be a pain, and mean more clicks for the user. Navigation aside, there are some good additions to the site, More user generated content is normally a good thing – promoting reader comment/discussion on stories will have them coming back to the site more often, making for a stickier experience. The top right, under the nav bar, is now devoted to the latest video, audio and photos, and users can use the tab to flick between them. In addition, the video content changes as you naigate around different sports sections. 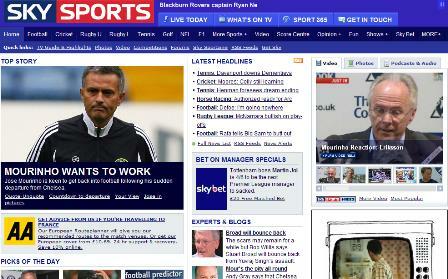 Sky will also show some exclusive web footage via the site, and some Sky Sports events and programming will be streamed online. 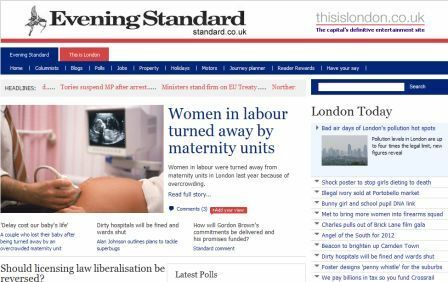 The Evening Standard launched a new website this week with news, blogs and comment from the London daily.